Mark Solveson, an application engineer at ANSYS, describes in detail how multiphysics system simulation provides insight into the operations of actuators. NASA is expanding its materials science research by flying an experiment on the U.S. Air Force X-37B space plane. The Air Force operates the unpiloted, robotically controlled, and reusable X-37B space plane to test technology during long-duration missions. By flying the Materials Exposure and Technology Innovation in Space (METIS) investigation on the X-37B, materials scientists have the opportunity to expose almost 100 different materials samples to the space environment for more than 200 days. A new technology that creates a rainbow of optical colors with ultra-thin layers of silicon has been demonstrated by a research group at the University of Alabama in Huntsville (UAH). The technique produces a colorfast material without dyes. Friction, the force that slows down objects as they slide across a surface, can save lives when car brakes are slammed. Yet despite its obvious importance, no one knows for sure how friction works at the level of atoms and molecules. Outlast and outperform standard metal bearings with engineered plastics! Over the past 30 years, there has been a major evolution in the advancement and use of engineered plastic materials in bearing applications. Today, plastic bearings are not only lighter and less expensive than their metal counterparts, but, unknown to many design engineers, these high-tech plastics can outlast metal bearings in unforgiving environments. Uncover common misconceptions and learn the true reliability of iglide® plastic bearings in this free whitepaper from igus. Get the .PDF whitepaper (no registration required). When the first direct metal laser sintering (DMLS) machines hit the production floor, some in the manufacturing community assumed the end of traditional machining was near. As it turns out, the reality of DMLS is slightly different than those early assumptions. DMLS produces fully dense metal parts directly from CAD models, often with an accuracy and surface finish that allows a part to go directly into service. Most importantly, says Proto Labs Engineering Manager Gus Breiland, if you have a highly complex part that is impossible to machine, DMLS may be the answer. The DV Series was designed as the next generation of Clippard's original EV line of popular "Mouse" valves. The DV-3 line of Minimatic electronic valves consists of precision-built three-way control valves that utilize a unique, patented valving principle. With a solid and sleek design, high flow rates to 70 l/min., and a cycle life over a billion, these valves are ideal for many applications across numerous diverse industries. This series is also highly modifiable with many flow, mounting, pressure, voltage, material, and other options. 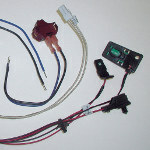 Integra Electronics, a specialty electronics distributor, has launched a Special Manufacturing Program (SMP) that delivers tailored switches, switch assemblies, and sub-assemblies that meet customer design requirements. Serving a wide range of applications including mil/aero, industrial, appliance, and commercial, Integra Electronics partners with CW Industries to offer an efficient switch solution for OEMs with small-to-medium volume custom switch requirements. 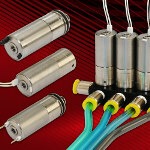 Solutions range from rocker, toggle, slide, and pushbutton actuators to sealed and high-temperature switch bodies. Two new grades in the 8000 Series of general-purpose thermoplastic elastomers (TPEs) -- 8088N (colorable) and 8088BL (black lubricated) -- have passed FMVSS302 specifications for flammability, making them suited for automotive interior applications. Both are supplied as ready-to-use pellets in 1,000-lb quantities and capable of being overmolded onto polypropylene (PP). Elastocon 8088N is a Shore A 88, colorable TPE for applications that call for rubber-like properties and a good surface finish ideally suited for consumer goods and industrial applications requiring U.V. stability. Elastocon 8088BL is a Shore A 90 black, lubricated TPE for applications that call for high impact resistance and a reduced COF (coefficient of friction). For applications demanding very high torque, drive specialist maxon motor has created its EC-i 40 DC brushless motor in three high-torque versions. The iron-core internal rotor drive is available with a diameter of 40 mm and is ideally suited for applications in robotics, prosthetics, and industrial automation. 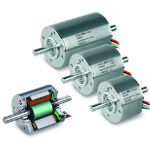 The strongest motor in this series offers a maximum nominal torque of 234 mNm and is 56 mm in length. 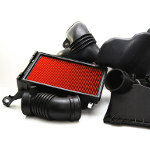 It exceeds the performance of its precursor model by up to 70 percent. Pacific Northwest National Laboratory (PNNL) researchers have demonstrated a new process for the expanded use of lightweight aluminum in cars and trucks at the speed, scale, quality, and consistency required by the auto industry. The process reduces production time and costs while yielding strong and lightweight parts, for example delivering a car door that is 62 percent lighter and 25 percent cheaper than that produced with today's manufacturing methods. U.K.-based Reaction Engines Ltd. recently announced that analysis undertaken by the United States' Air Force Research Laboratory (AFRL) has confirmed the feasibility of the Synergetic Air-Breathing Rocket Engine (SABRE) engine cycle concept. SABRE is an innovative class of aerospace propulsion that has the potential to provide efficient air-breathing thrust from standstill on the runway to speeds above Mach 5 (4,500 mph) in the atmosphere -- twice as fast as jet engines. A National Institute of Biomedical Imaging and Bioengineering (NIBIB) grantee has developed an ultrafast camera that can acquire two-dimensional images at 100 billion frames per second, a speed capable of revealing light pulses and other phenomena previously too fast to be observed. University of Michigan engineers have taken the lead in constructing millimeter-size fully autonomous computing systems that can perform on many alternating platforms. Dennis Sylvester and David Blaauw, professors of Electrical Engineering and Computer Science, have developed the Michigan Micro Mote (M3) units capable of harvesting solar power to utilize wireless communication, pressure, and temperature sensors -- and even still-image and video processing. You can fit 150 of these computers inside a thimble.